How to enjoy the sun safely this summer. Think of sunscreen as your new best friend this summer. Sunscreen should be used every day—even when it’s cloudy outside. After what seemed like a never-ending winter, and a soggy spring, we can finally see summer on the horizon. While the sun and heat will beckon us to the beach and the pool, you have to be sure to protect your body’s biggest organ -- your skin. 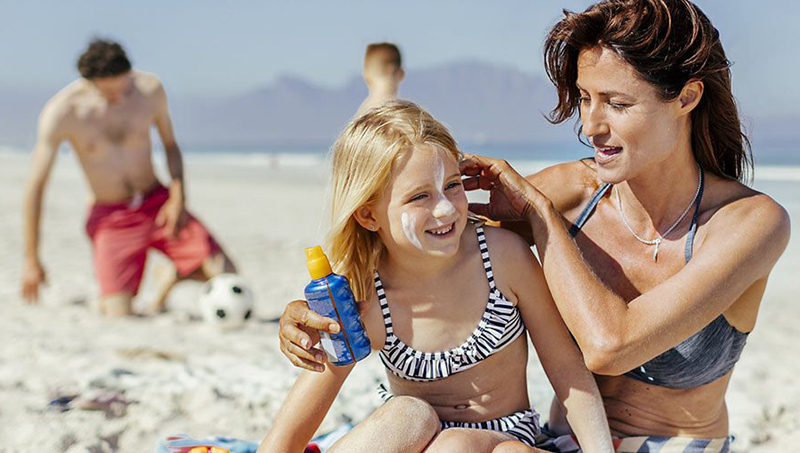 We spoke to Dr.Desiree Ratner, director of the Comprehensive Skin Cancer Center at Mount Sinai Downtown, about the having fun in the sun safely with the right amount of sun protection. The American Academy of Dermatology recommends sunscreen with an SPF (sun protection factor) of 30 or higher with broad-spectrum protection (meaning protection against UVA and UVB rays). Ideally, that sunscreen should also be water-resistant. Should you use separate sunscreen for your face? Facial sunscreen formulas tend to be more moisturizing and less irritating than some of the body-specific sunscreens, and are less likely to cause acne. The body-specific sunscreens, especially the sprays, may contain more alcohol, which can dry out or irritate facial skin. How do you properly use a sunscreen? It is important to use enough sunscreen to generously coat all areas not covered by clothing, including the face, ears, neck, arms and hands. The amount of sun protection needed to cover the exposed areas of the body will be roughly the size of a shot glass. Sunscreen should be applied to dry skin 15-30 minutes before going outdoors so it has time to bind, and it should be reapplied every two hours, or sooner if you’ve been swimming or sweating. Are sprays as good as lotions? Choosing a sunscreen is a matter of personal choice. The best kind is the one that you will keep using. While sprays are easy to use and very popular, it can be difficult to tell whether you have applied enough to your skin. Creams and lotions take longer to massage into the skin, but it is easier to tell when you’ve put enough on. Creams and lotions also tend to be more moisturizing. My makeup has sunscreen in it. Is that an adequate amount of sun protection? If your makeup has a high enough SPF, preferably 30, then perhaps. However, it is important to use enough of it to cover all exposed areas, and remember that it has to be reapplied every couple of hours to optimize protection. If you’re going to rely on foundation as your sunscreen, then you would also need to apply it to your neck, ears, and chest as well. It may be worth using a lightweight facial sunscreen under your foundation with sunscreen for maximum effect. Is there any such thing as a “base” or “safe” tan? The simple answer is no. When skin tans, it is trying to prevent damage from the sun’s UV rays. If you really want a tan, think about using a sunless tanner, remembering that it will give you color, but will not provide any UV protection. What are some common misconceptions/myths about skin cancer and people of color? The biggest misconception is that darker-skinned people don’t get skin cancer, which just isn’t true. While darker-skinned people are less susceptible to UV damage because they have more protective pigment, they can still develop skin cancer, including on body parts rarely exposed to the sun, like the palms of the hands and the soles of the feet. While skin cancer is curable if diagnosed early, in people of color it tends to be diagnosed later and can be more deadly. For this reason, people of all ethnicities should be aware of changes and new lesions on their skin, and should see a dermatologist if they notice areas that bleed, crust, don’t heal, or grow or about which they are concerned. What precautions should people of color take with their skin? Regardless of skin type, everyone should use a sunscreen with an SPF of 30 or higher, applying it every two hours, and more frequently if swimming or sweating. Skin checks with a dermatologist should be done yearly, or sooner if new, changing or bleeding lesions are noted. Sunscreen should be used every day—even when it’s cloudy outside—since every time the sun’s rays hit the skin, they cause damage, leading not only to skin cancer, but also to age spots and wrinkles. Sunscreens help to protect against all of those things. The more you protect yourself from the sun, the more beautiful and healthy your skin will be. Lifestyle - U.S. Daily News: How to enjoy the sun safely this summer.